Is It Possible to Retrieve Deleted Videos on iPhone? iPhone, as a kind of carry-on device, plays an important role in people’s daily life. For instance, users are accustomed to taking videos with it anytime and anywhere to record the remarkable moment and share them with each other. When users are enjoying its convenience, they also bear the risk of iPhone data loss. Take iPhone video as an example, users often delete some unwanted videos to release some space. Sometimes, they may remove some vital iPhone videos by mistake. Here comes the question: how to recover deleted iPhone videos? In general, deleting videos on iPhone meanings wiping them from the device forever and it is impossible to retrieve that deleted video from the iPhone directly. However, some pieces of third-party iPhone video recovery software make it possible to separately restore deleted iPhone videos from iTunes and iCloud backup file. MiniTool Mobile Recovery for iOS is an excellent representative. So, the next section of this post will lead users to get their deleted iPhone videos back with this tool. How to Recover Deleted iPhone Videos? MiniTool Mobile Recovery for iOS is a professional iOS data recovery program. The data types it can recover are various including photos, videos, messages, notes, and more. And it owns three modules – “Recover from iOS Device”, “Recover from iTunes Backup File”, and “Recover from iCloud Backup File”. 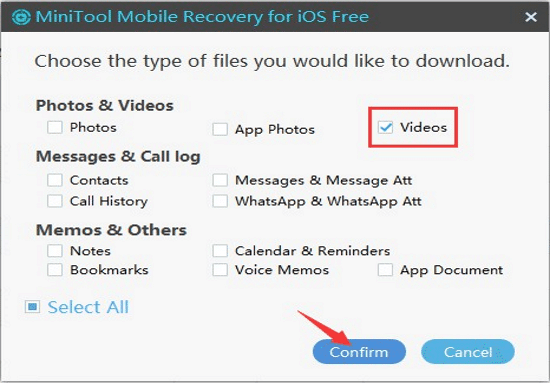 Since it is impossible to retrieve deleted video from iPhone directly, users should apply the rest two recovery modules to get them back. Besides, the Free Edition can recover two pieces of video, so users can firstly utilize its Free Edition to test its function, and there are both Windows version and Mac version for them to choose. 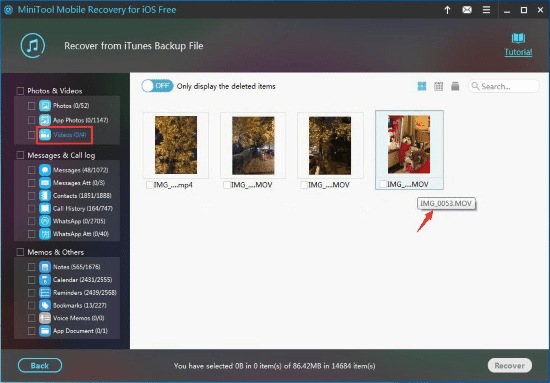 If the deleted iPhone videos are stored on the previous iTunes backup, users should consider using the module “Recover from iTunes Backup File”. 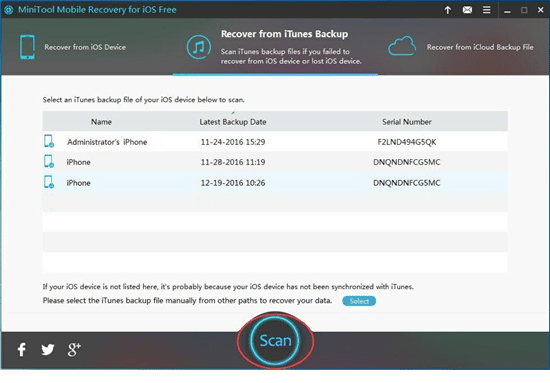 To make this recovery module run smoothly, they should guarantee that the target iTunes backup file is saved on the computer. Step 1: When users open the software, they will see the three recovery modules are displayed on the main interface. They just need to select the corresponding module and the iTunes backup files will be displayed here. However, if the target one is not listed here, users need to press on “Select” button and pick it out from the storage path on the pop-out interface to add it manually. Choose the iTunes backup file and click on “Scan” button. Step 2: This is about the results interface. Since users want to recover videos only, they should click on “Videos” from the left list. Then the scanned iPhone videos will be shown on the interface with their name and preview picture which can facility the selection. Choose the videos needed to be recovered, and click on “Recover” button. Step 3: Users will see a pop-out window as follows. Here, users are able to save the selected iPhone videos to the default path or click on “Browse” to choose another storage path. Then, click on “Recover” to save them. Finally, users can employ these recovered iPhone videos directly. 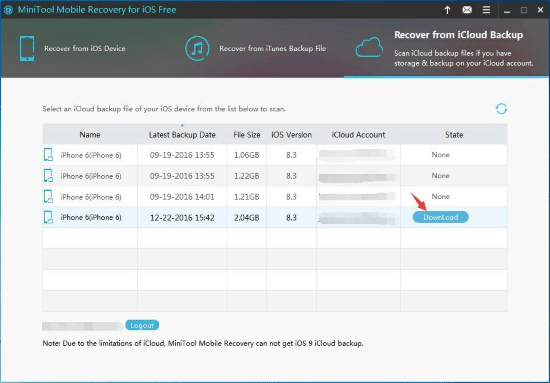 If users have made an iCloud backup before the deletion of iPhone videos, they also can use this recovery module “Recover from iCloud Backup” to undelete iPhone videos. But they should notice that this software can’t get iOS 9 and the latter version’s iCloud backup due to the limitations of iCloud. 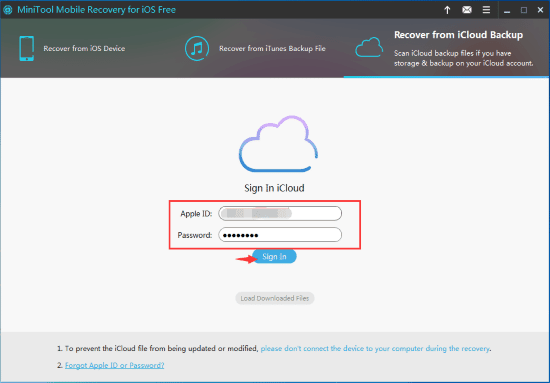 Step 1: Choose “Recover from iCloud Backup File” from the interface, and type in “Apple ID” and “Password”. Then press “Sign In” button. Step 2: This interface will display the available iCloud backup files. Users can choose the relative one by judging from their “Name”, “Latest Backup Date” and “File Size”. Then click on “DownLoad” to continue. Step 3: This pop-out window allows the user to choose downloading videos separately. Just check “Videos” and click on “Confirm” button. Step 4: When the downloading process is finished, users will enter the results interface which is similar to module 1, and the rest operations are the same. After these simple steps, users will get their deleted iPhone videos back. Whether this software is useful or not, they will have their own judgment. Here, it is necessary for users to know that not only iPhone videos but also iPhone photos can’t be recovered from the device directly. Still, this software can get the deleted iPhone photos back from iTunes and iCloud backup files. Use this iPhone transfer software to transfer and backup iPhone video to computer, preventing yourself from data loss.